This Municipal Program is funded by the Provincial Main Street Revitilization Initiative which was created to support and benefit small businesses offering grants to small business property owner/tenants in main street areas for façade improvements. The purpose of the program is to help finance façade improvements that would otherwise be considered cost prohibitive by a property owner/tenant of a small business in a "main street area", specifically located on Main Street, Ambridge Drive, Cambridge Drive, Victoria Road or Highway 67. Grant applications will be considered on a first come, first serve basis to the limit of the available funding. 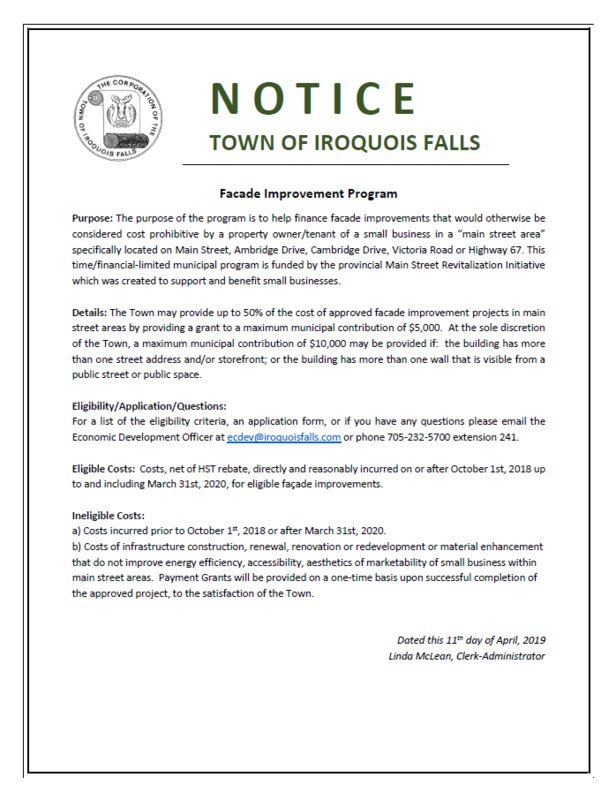 The Town may provides up to 50% of the cost of approved façade improvement projects in main street areas by providing a grant to a maximum municipal contibution of $5,000.00. • The building has more than one wall that is visible from a public street or public space. Select Notice for full view. Please visit Bill Greenway at Town Hall, 253 Main Street.